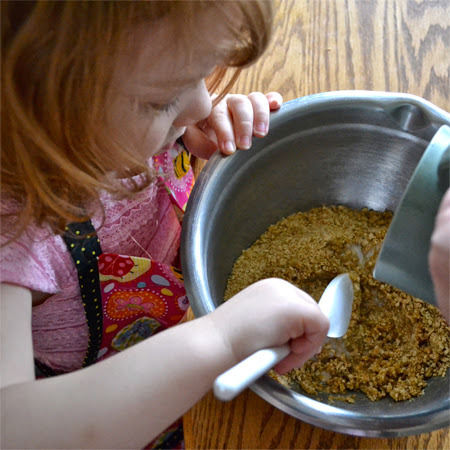 I've been trying to make a recipe a week with Jellybean. She really enjoys being in the kitchen so I'm trying to continually give her opportunities. 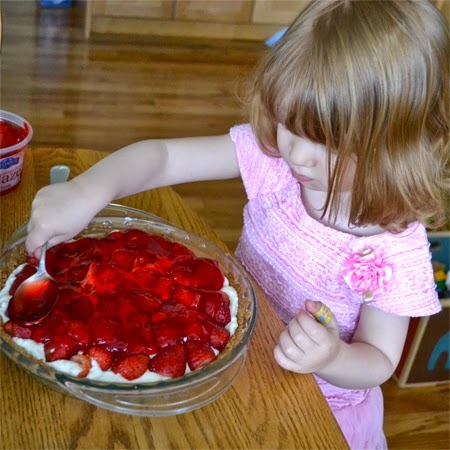 Shortly after the baby came home, she decided that she wanted to make a strawberry pie. As luck would have it, my mother had a pretty good recipe that I thought Jellybean could help a lot with. So we got to work. 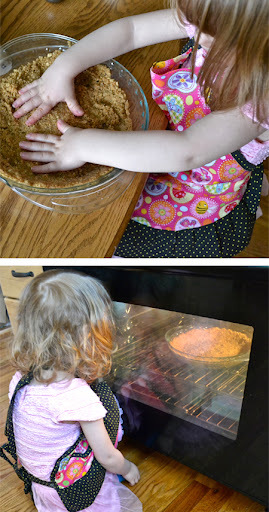 We needed to make a graham cracker crust first. 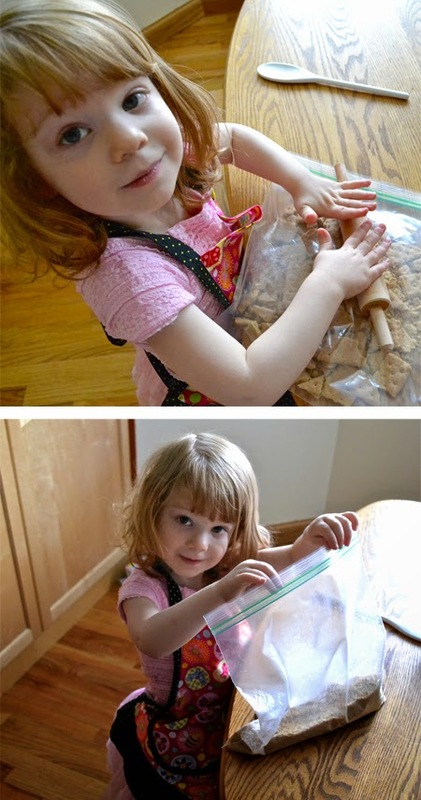 We could have gone store bought, but what three year old doesn't enjoy crushing up graham crackers? I put some in a bag, handed the rolling pin to her and let her go to town. 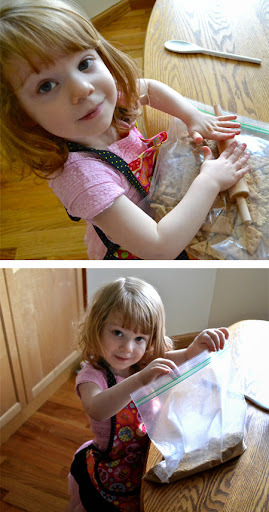 I helped a little, but she did a pretty fine job of making graham cracker crumbs. It was also a good way of working on rolling with the pin. Then we worked on stirring. I poured in the melted butter and sugar while she stirred. Then I let her press the crumbs into the pie plate. I put the crust into the oven and then got distracted and didn't hear the timer go off (a very common problem lately). No real harm done, the crust was mighty tough though. I wouldn't recommend an over-baked crust unless you have a jack-hammer on hand. While the crust cooled, I whipped up some Dream Whip and cream cheese and then I helped Jellybean cut up some strawberries. This was my first attempt at letting her use a knife. 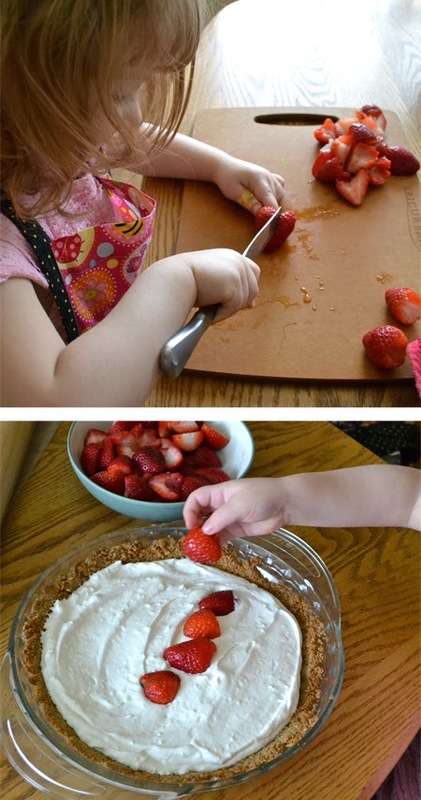 A butter knife was sufficient for cutting the strawberries and appropriate for her age. We talked a lot about knife safety and about keeping fingers away from the blade. Also, about the difference between this knife and Mommy's knives in the drawer that she isn't allowed to use. Once the strawberries were all cut up, I filled the shell with the Dream Whip mixture and let her line the top with the strawberries. She was pretty proud of herself. Last step, Danish Dessert. I couldn't find any in the store, so I settled for a Lighthouse Strawberry Glaze. It was essentially the same thing. I dolloped the glaze on the pie and Jellybean spread it around. After a little decoration, the pie was complete. This was a perfect recipe to put together with my Little Chef. She was able to help with almost every step. The pie was delicious (better the next day after the over-baked crust had softened a bit). Such a fun, simple recipe, too. Whip two envelopes Dream Whip with sugar, milk and vanilla. Then incorporate the softened cream cheese. Pour mixture into cooled graham cracker crust. Halve strawberries and sprinkle with sugar. 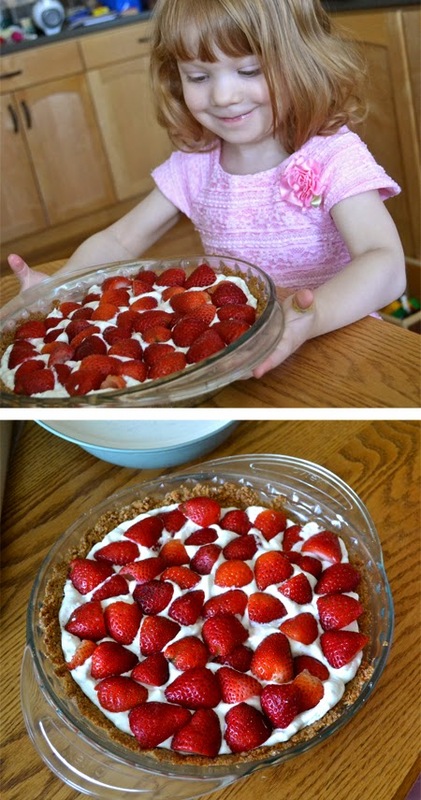 Top pie with strawberries. Glaze top with cooled Danish Dessert or strawberry glaze. Add more whipped topping and strawberries if desired. And, what a delicious pie! Definitely something my boys would love! Looks delicious...and I love how much she actually did to prepare it! Pinning! 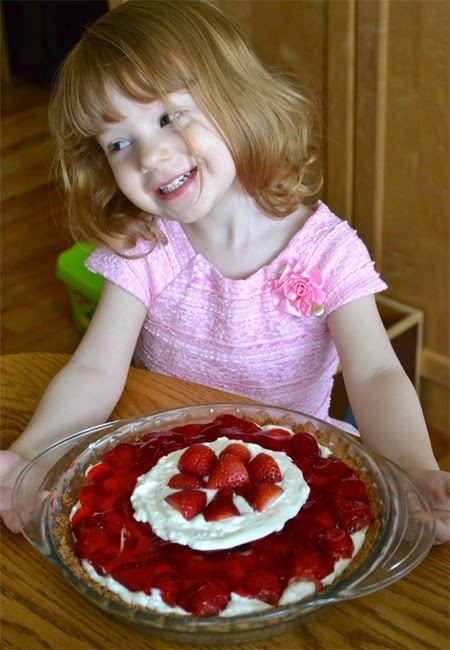 It was so fun making this recipe with her because she could do so many of the steps herself. She was so proud, too. Thanks for pinning!